Welcome to Florida, where no amount of weapons or crazed reptiles is enough to make things all that unusual. How about a house full of bladed weapons and what might be an altar to Satan? Pretty normal by Florida standards, but still interesting for the rest of the known world. Cops serving felony warrants at the home of a woman from Brooksville, Florida, found a fun surprise in the form of potential death. 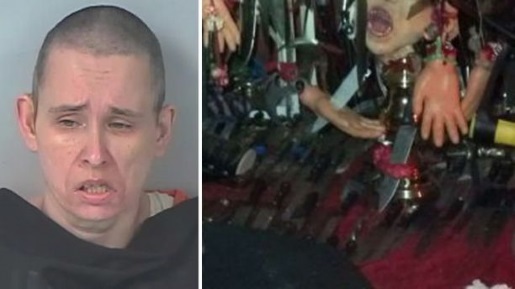 When police took Nickole Dykema into custody, they found 3500 bladed weapons in her home, along with an altar decorated with pentagrams. Of course, one of the cops was almost injured during the arrest. When Nickole answered the door, she answered it with a machete, and nearly stabbed a cop in the face in the process. Hence, arrested with no bond. Still, at least she wasn’t successful; it’s not like she didn’t have ample things to choose from if that first machete attack succeeded. She took multiple bean bag rounds and a tazer shot to subdue her, as she attacked the officers multiple times with multiple weapons. The one good thing you can say about her is that she refused to give up the first time!